Formed in July 1987 Tile Heritage just entered into its 25th year this summer. tile history both past and present. 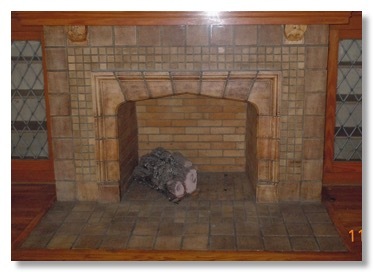 A woman in Columbus, Ohio was buying an apartment and found this “antiquated” fireplace mantel where she wished to cut a doorway. Thinking the tiles might be Rookwood, she contacted Larry Mobley who in turn contacted Tile Heritage. 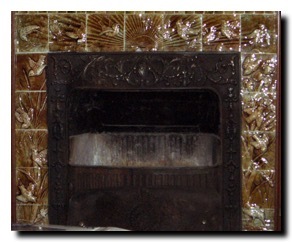 The tiles were made at California Art Tile Company in Richmond, California, likely dating to the mid to late 1920s. The arch around the opening is #704 and the corbels ("End of the Trail") are #503. 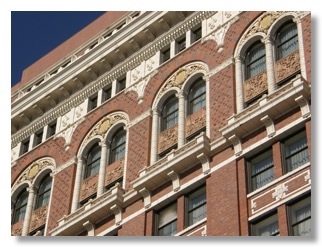 Cal Art was founded in 1923 by a Scot, James White Hislop, a third generation brick maker, who put together an impressive crew of experienced tile makers who in turn produced one of the most prolific and artistic bodies of work in Northern California. The company closed in the mid-1950s. 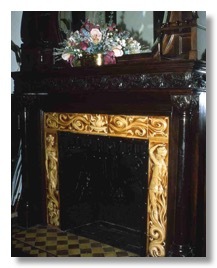 The mantel appears to be in pristine condition. 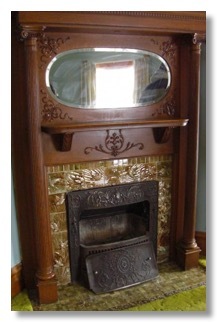 It would be truly unfortunate were this fireplace to be destroyed. 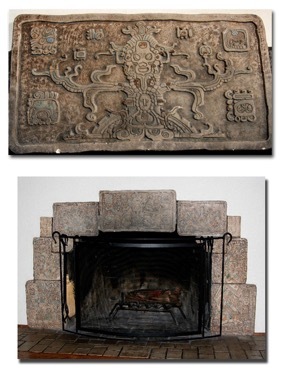 An artist in Salt Lake City found Tile Heritage online while researching his tile fireplace. His home was built about 1910. He had been told by a few folks that these were California ceramic tiles. The larger picture tiles are 9 inches square and the smaller red tiles are 6 inches square. The picture tiles have relief, that is, they are raised. 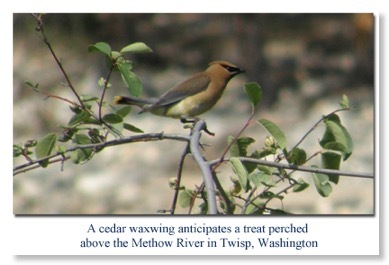 He wondered if the scene might be Lake Tahoe, and thanked us for whatever info we might be able to send along. 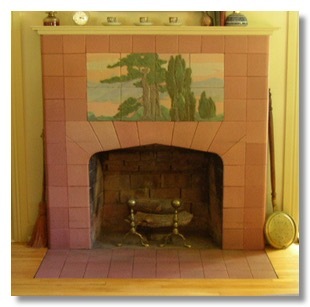 The tiles are Rookwood Faience from Rookwood Pottery in Cincinnati. Titled “Modeled Landscape” in the company’s 1912 catalog, the panel is numbered N1352Y1, 2, 3 and 4. No. 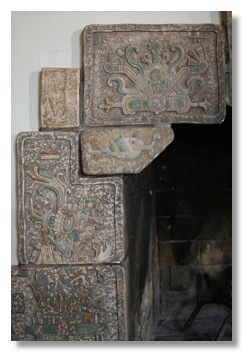 1568 Mayan Fire Arch. TRENT for the Trent Tile Company, Trenton, New Jersey (1882-1939). For more information on Trent tile see our Tile of the Month. 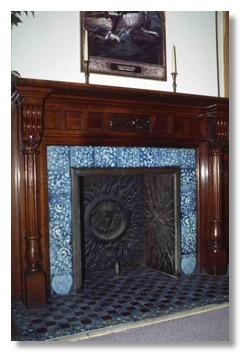 The 900 block of West Franklin Street in Richmond, Virginia contains a treasure trove of late 19th century fireplaces with tiled surrounds. For roughly 30 years Raul Coronel now in his mid-80s, was a mid-century master ceramist in Southern California, throwing, sculpting, playing in clay and glaze. 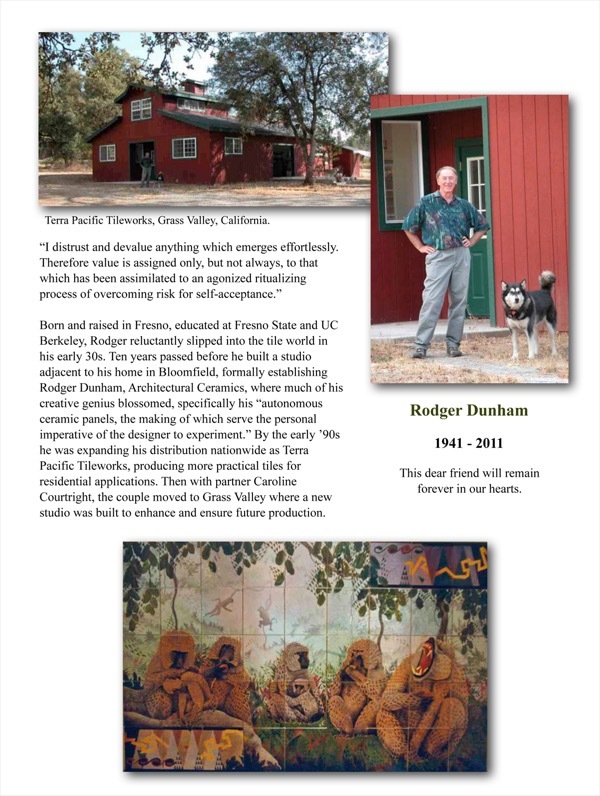 Included in his prolific offering were decorative tiles and murals produced on a custom, job by job, basis for both private residences and commercial establishments. Born (1926) and raised in Mexicali, Raul came to the U.S. when he was 14, becoming a U.S. citizen when he joined the Marine Corps in 1944. After the war he studied under a number of master potters at different colleges and universities before establishing Stoneware Designs, Inc. in LA in 1958. We are indebted to the captivating exchange at 20th Century Forum. Also AMOCA will be hosting “Common Ground: Ceramics in Southern California 1945-1975” Nov. 12, 2011 through March 31, 2012, which will include Coronel’s work. 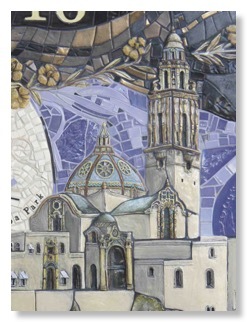 Cha-Rie Tang at Pasadena Craftsman Tile offers handmade decorative relief tiles in the tradition of Ernest Batchelder, producing classic reproductions as well as original designs. 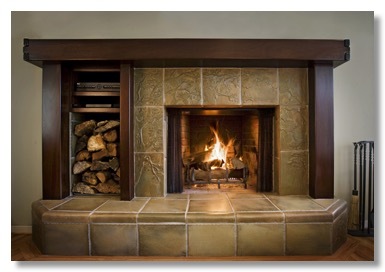 Fireplace mantels, fountains, walls and backsplashes are among her specialties. In 1889 a 20-year-old disgruntled clerk from San Francisco, Louis Davenport, moved to what was then Spokane Falls, a small town in northeastern Washington State, where his uncle owned a restaurant. Following the Great Fire that swept through the downtown area later that year, the young man established his own eatery, serving waffles from a tent no less! A fortuitous choice it was as the city was just entering a period of growth and prosperity that would catapult this entrepreneur to center stage. Early in the 20th century Davenport hired architect Kirtland Cutter, who designed a playfully attractive Mission Revival style restaurant that captured the imagination of patrons from well beyond the city limits. And within a decade the two were engaged once again, this time expanding the facility to encompass an entire city block with what became a five-star luxury hotel, the finest accommodation between Seattle and Minneapolis. 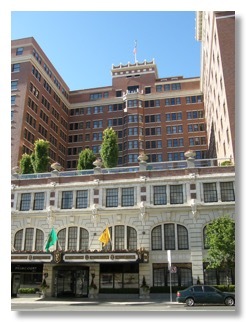 Opening in September of 1914, the Davenport Hotel was inspired by the great architects of France, England and Spain, and it was this international flavor that drew guests from around the world. 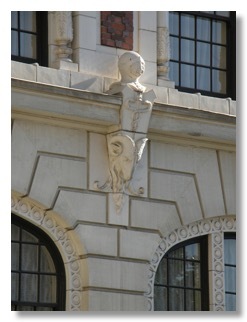 Cutter chose to adorn the exterior of the hotel with a combination of local brick from Washington Brick & Lime Co. and creme-colored architectural terra cotta, the latter featuring sculpted busts of knights in armour, the heads of Rocky Mountain Bighorn Sheep among the more generic designs. After many years of high-class service, Louis Davenport finally sold the hotel in 1945 and, sadly, after a number of uninspired owners, the hotel was closed in 1985. Local developers Walt and Karen Worthy purchased the property in 2000, spending two years and over $40 million to bring the property back to its original grandeur. 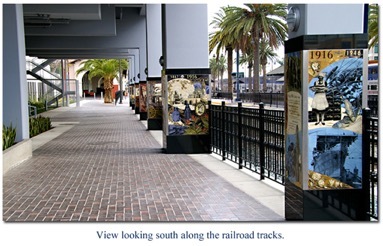 The historical column murals were conceived to help raise public awareness of San Diego history. The goal is to encourage people to learn more about our past and then use their understanding to be more interested and concerned community members. 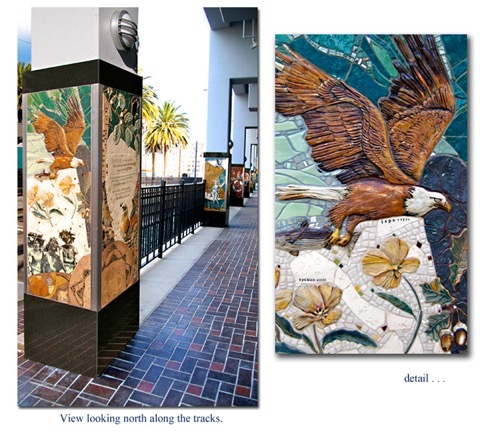 The series of ten 4-sided columns, each side fitted with a 2’ x 5’ panel, depicts the history of san Diego. 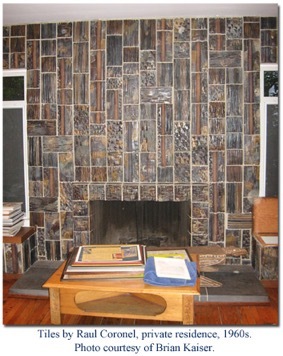 Handmade, silk-screened image tiles, sculpted tiles, and broken tile mosaics were applied to cement board with thin-set mortar, then grouted in the artist’s studio. The overall feeling of each era of history is artistically depicted through imagery with small sections of supporting text. Each Column represents a different period in San Diego history. 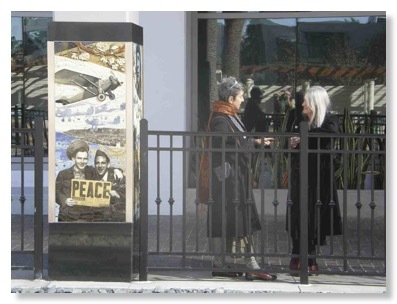 Not intended to be a complete time line, the murals provide “glimpses” of history that best represent the feeling of the times as interpreted by the artist. In many cases the familiar imagery speaks for itself. Location: Track side of the Sapphire Tower, between W. A and W. Ash Streets, San Diego. Not a THF Member? . . JOIN IN! Another way to SUPPORT THF! Tiling is one of the most popular, beautiful, and durable finishes in a home. And when done properly, it's richly rewarding for the homeowner, and highly profitable for the contractor. Yet the finest tilework can easily fail if placed over a poor setting bed, or installed with the wrong materials, which can cause time-consuming and expensive callbacks. In this comprehensive guide to the best tiling practice, you'll learn step-by-step how to use the latest materials and methods in nearly every tile application. The right tile, materials and installation methods for every job. The best details for long-lasting floor, wall, countertop, and shower installations. How to assess and reinforce a structure before installing tile. Preparing plywood, concrete, and other surfaces for proper tile adhesion. Foolproof techniques for tiling out-of-level and uneven surfaces. Preventing common cracks and water leaks with movement joints. Using tile membranes for 100% waterproof installations. Perfecting grout joints to protect tile edges, slow water penetration, and resist staining. On-the-job tips, tricks, and jigs for getting the most out of tile tools and equipment. Why sub out your tiling jobs? Tiling for Contractors will give you the critical knowledge, skill, and confidence to tackle any tiling job yourself, no matter how complex! Learn from the best. 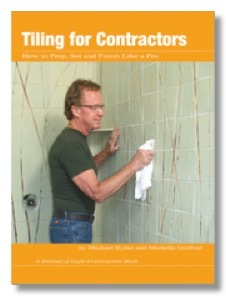 Best-selling author Michael Byrne has been a ceramic tile installer, contractor, consultant and industry expert for more than 40 years. He's also a popular speaker and instructor at countless seminars and trade shows each year. 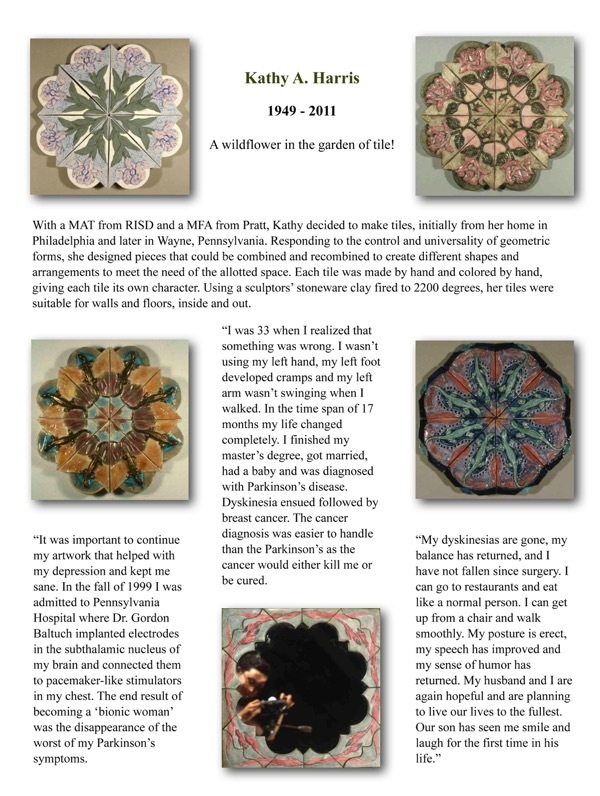 Michelle Griffoul is one of the most well-known artists in the ceramic tile industry. She also manufactures and installs hand-crafted mosaic and decorative tiles.